HD Electrical are an established electrical contracting company based in Mansfield supplying a comprehensive range of domestic and commercial services across the East Midlands. 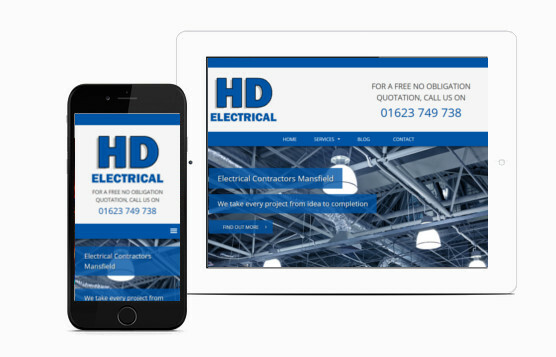 HD Electrical were looking for a website to allow them to update with news articles which gave customers a clear understanding of their process and services and was modern and responsive. Using their company colour scheme and understanding how HD Electrical wanted to display their information we created an attractive home page layout displaying everything needed for a potential new customer to understand with a clear how do we work section and service overview helping to convert a visit into an enquiry. A trademark JKE well built easy to navigate, attractive website which works just as well on small devices as it does on large screens.